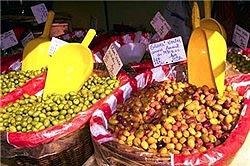 At harvest time, many Italian women cure bright green, bitter olives in salt water, to be eaten later throughout the winter. This is a simple family recipe that yields about 10 large jars of olives. Crack the olives, and place in an old, clean pillow case. Drop the olive filled case into a pail filled with cold water, ensuring the water covers the olives. Change the water twice daily for three days. Measure 10 large jars of water into a large pot. Add 30 tablespoons of salt to this pot, and stir to combine. Bring the water to a boil, and then let it cool. Drain the olives from the pail, and fill the jars with the olives, adding an additional tablespoon of salt to each jar. Add the salt water to each jar, covering the olives. Seal the jars, and let them sit for one month. Drain the olives, and rinse under cold water. Pat dry and mix with the remaining ingredients. Serve!